We went through the steps we had agreed upon, and it became clear that he would be late to school (and have to take the consequences of that behavior). UPDATE: He was 20 minutes late. I also have a chronic illness (or three) and take many pills three times a day. Nothing we did could change my little one's refusal to take the meds this morning. 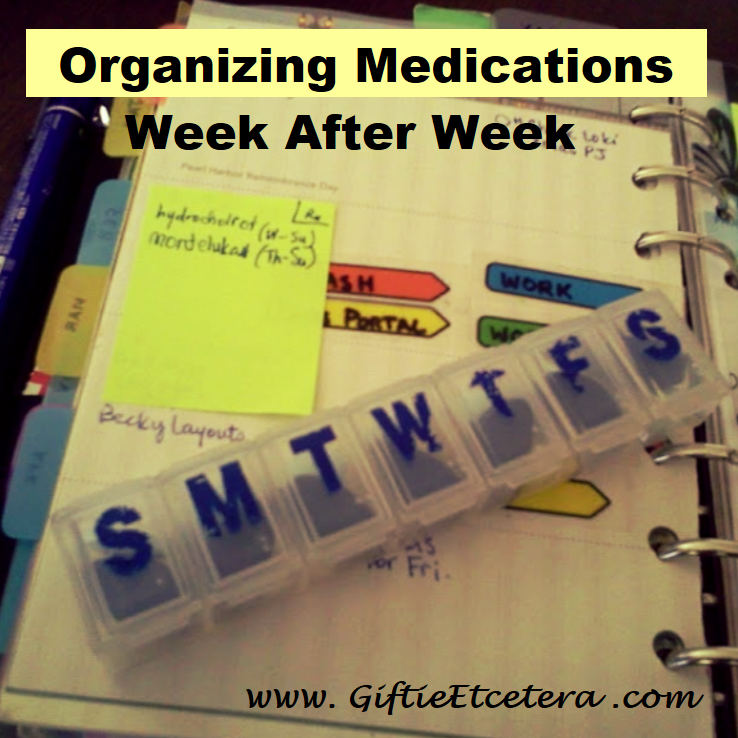 But I do something every week that makes it easier to make sure we are taking the right pills at the right time. I actually use a zippered tote bag to store all of our pills, so I can grab the whole tote if we are going to the ER. TIP: Add a cheap phone charger and a list of medical conditions, surgeries, and allergies for each family, along with contact information, to the tote in case of an emergency. I do mine on Sunday nights so that I can go to the pharmacy on Monday morning. I have to take one of my meds during the work day. That one goes in a tiny pill sorter. For am and pm meds, there are bigger, more appropriate pill sorters. There are even travel options. TIP: If multiple people in the household take meds, color code the sorters. Although I rarely use post-its on my weekly pages, I do (as pictured above) for pharmacy lists. That's because on Monday I might drop off the refill, but it might take a day or two to fill, and then I need to add to certain (empty) days in the sorter. A list of what I need at the pharmacy and what day I need it by can move from day-to-day on the weekly list, until the pill sorters hold the pills that are necessary to cover the rest of the week. That means that crestor MUST be refilled by Wednesday and then the refill must be added to the Wednesday through Sunday part of my pill holder. I hope this helps you deal with daily meds. If anyone has a brilliant idea for getting my 7 year old to take his meds, I am all ears. Let me know in the comments! My husband won't take his either. I've tried competitions, shaming, reminders of what his hospital stay was like, but nothing budges him. I suppose in your case when the penalties hit it might help him decide differently next time. What does L say would help him take the meds instead of everyone starting their day upset/distressed? I'm assuming there was something on that morning that he was particularly unhappy about? He says nothing will make it okay. We are considering having all of us take meds at once (even if Daddy and brother take tic tacs instead). On the off chance that you had a mischance would your family know where the greater part of your therapeutic or other vital data is kept? Do you really have your essential data kept on a rundown or some place with the goal that it could be discovered effortlessly if necessary? A great many people don't. Perhaps it's something that you should consider. I find a very good website for the Health Issues, If you want you can visit this site.